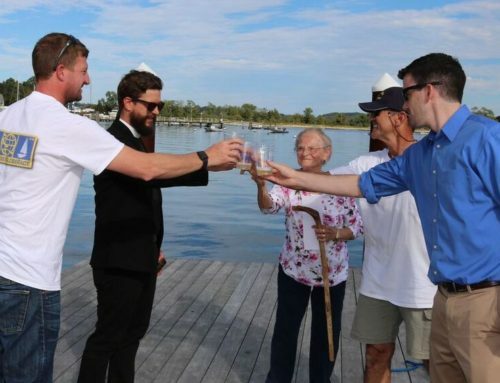 I purchased the yacht Puffin in July 2015 in upstate New York. 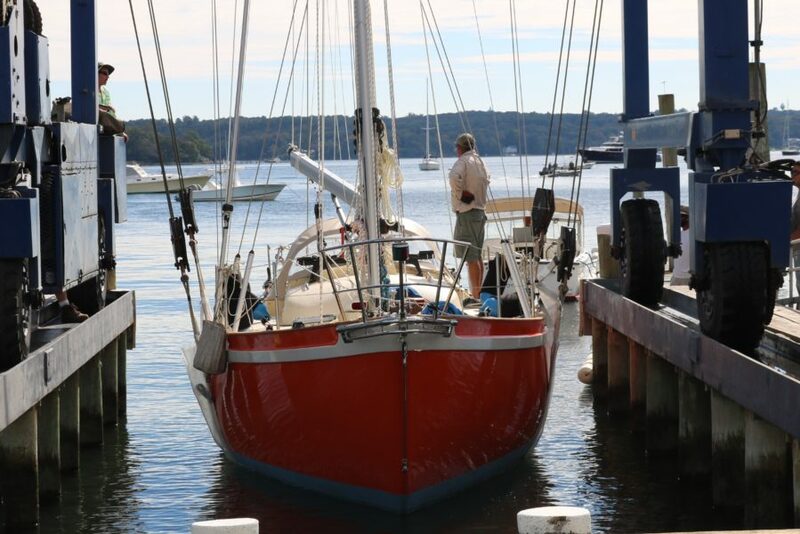 There was no way to sail her to my destination (Oyster Bay, NY), due to various conditions in need of repair(see page on Puffin). So I decided to sandblast the bottom right where she was before trucking her. Then I prepared her for the road by removing the pulpit railing, unstepping/wrapping the mast, and securing everything for the trucker. 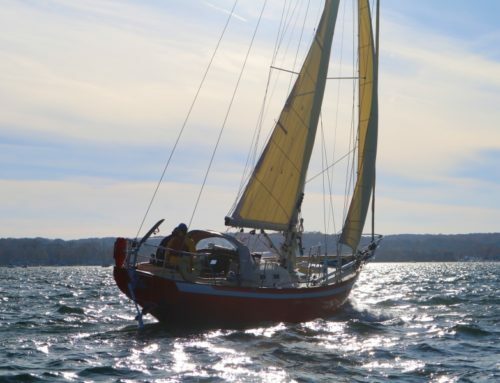 Not surprisingly, I encountered more and more complications (bowsprit ice damage, broken SS welding, unfriendly beehives, just to list a few) to add to my growing repair list. 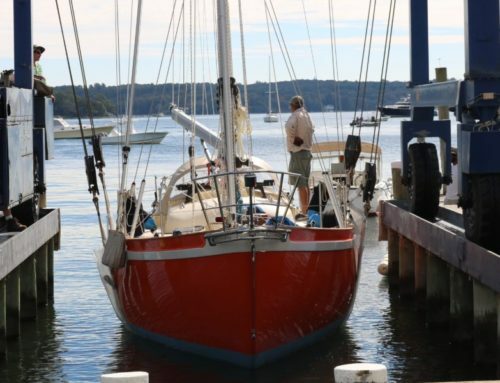 I was the sailing director at Seawanhaka Yacht Club at that time, so after the transport I blocked and covered the boat in the club’s boatyard and returned to focusing on my full time job. 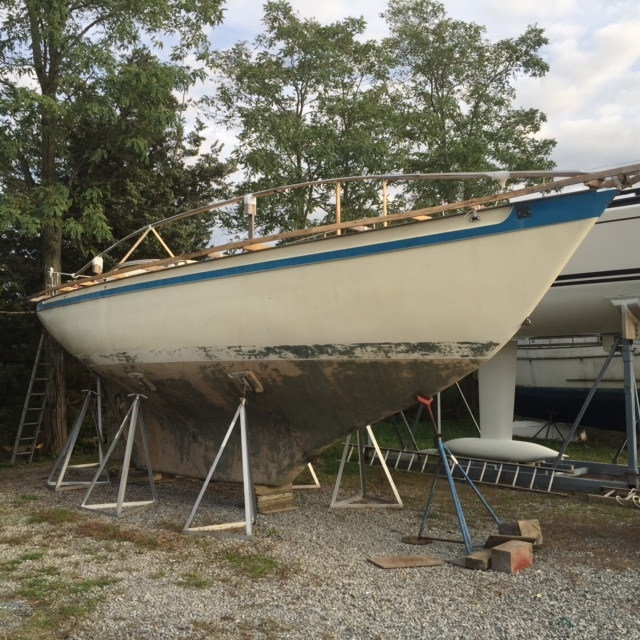 I was able to dig into the boat and start to strip her just after the main sailing season, and my discoveries were not joyful ones. 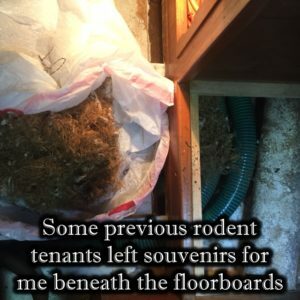 I had to open up the floorboards everywhere to get access to the tanks and plumbing. This is a time-consuming process due to the endless bung removal required (check out this video for a good idea of what this tedious task entails). In addition, I had to remove all the furniture doors and covers. The good news was that I could see the good quality of the woodwork; the bad news was that I could now also see what it had previously hidden. The fuel tank was heavily rusted steel, but was somehow magically still holding the old fuel. The most surprising discovery was a huge holding tank custom-built above the keel water tank, most likely by the first owner’s request in preparation for inland use. A lot of labor was required in order to learn more about this mysterious holding tank. 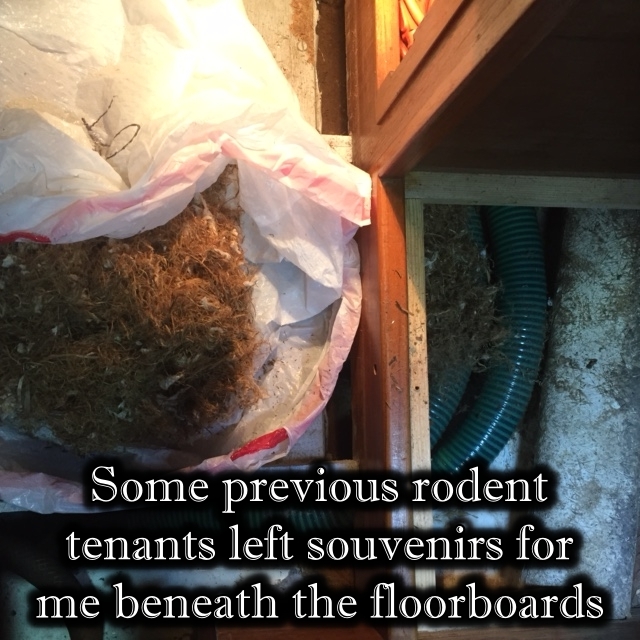 I had to remove the frames holding the heavy floorboards above it, and then open up the top cover, which was screwed and glued to the plywood laminate box below. Crap! Forgive my language; this is not referring to what I said at the time, but rather the material I discovered waiting for me inside the box… and a lot of it. It was mostly solidified, so less disturbing than it could have been, but it still required consumption of a double scotch that night. 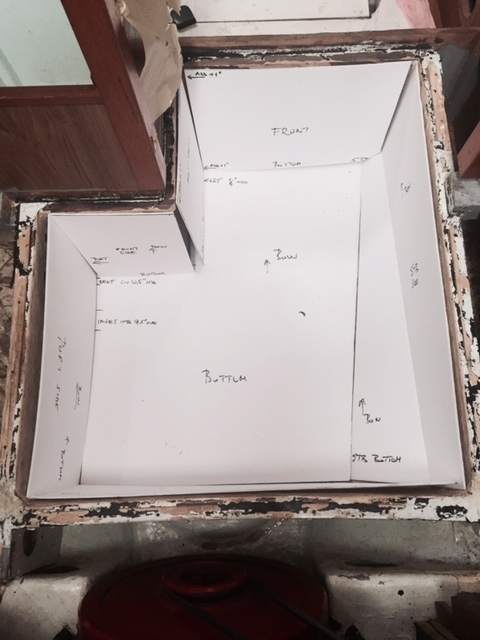 The plywood box was custom-built as a mold, with its irregular shape designed to fill the available space below. 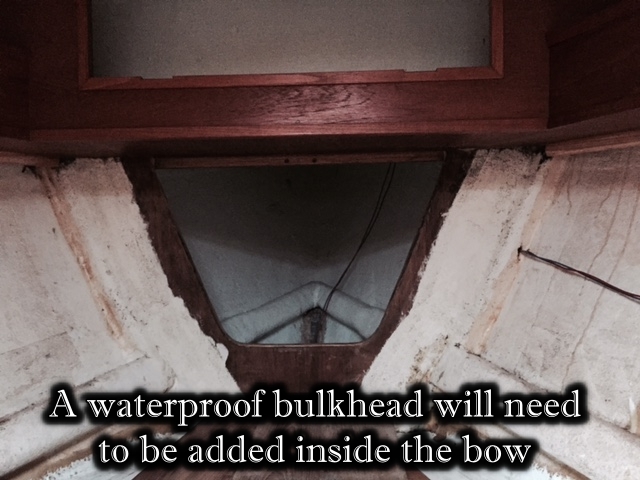 It had been fiberglassed on the inside to render it watertight for its intended use. It retained some of its odor even after my thorough cleaning efforts. 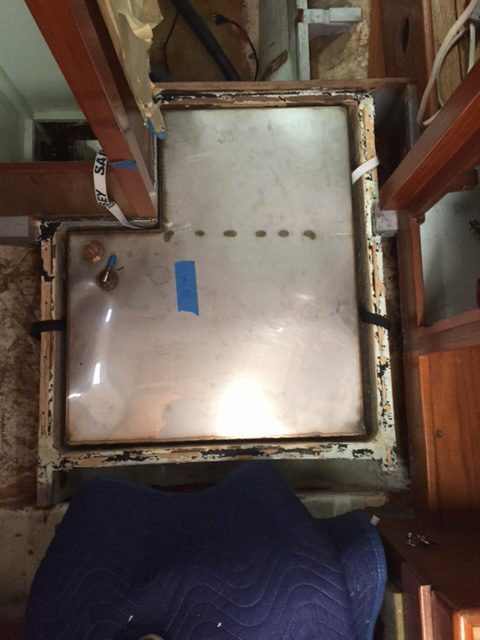 I could not trash it, because it was the holding platform for the combined engine cover and companionway steps. 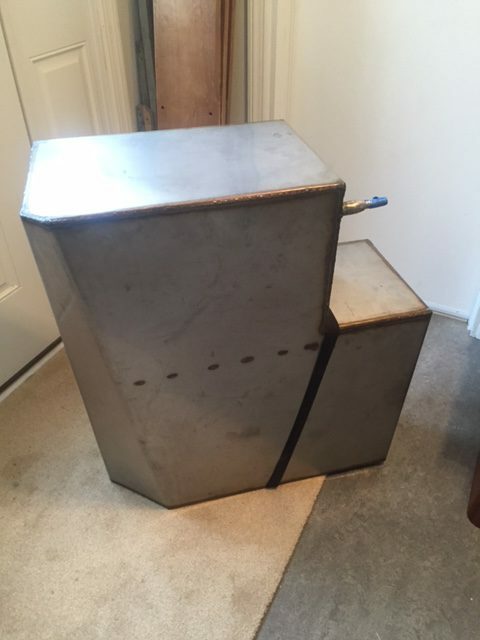 My solution was to put a stainless steel water tank inside it, since I would need additional water storage for my nonstop, 10-month-long race. It took a while to build the precise tank pattern from door skin, and I was praying to God for help not to mess it up. The next step was to get a machete and cut a pass in the plumbing jungle. I felt like Laocoön, the Trojan priest with the sea serpents, as I fought with the aged hoses (which had been hardened by the colder weather) to remove them from the labyrinth of the boat’s interior. 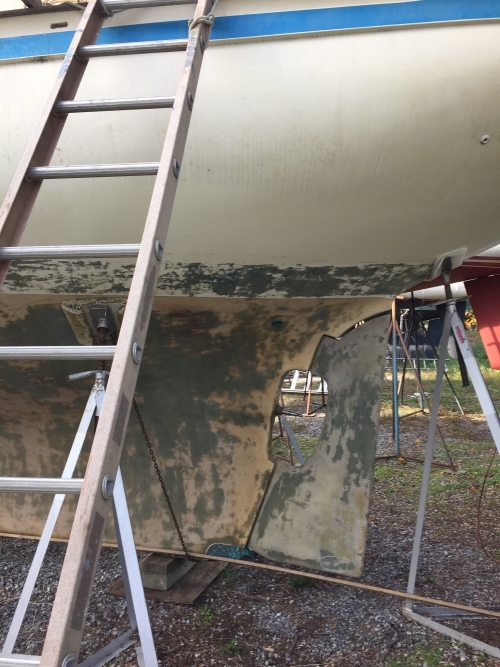 The condition of the freshwater fiberglass tank built in to the keel was still unknown. I found a gap of less than 2” between the top of the freshwater tank and the bottom of the holding tank above. With a telescopic mirror I was able to detect an inspection plate at the top of the freshwater tank. It looked at least 8” in diameter. I had to cut out a matching sized opening in the bottom of the holding tank. Well, this was the easy part; opening of the inspection plate without damage took another day or so. But my effort was well worth it, since the tank desperately needed mold removal and a thorough cleaning. The boater’s first priority should be the flotation, so my next working stage became the removal of the seacocks and through-hull fittings, which numbered more than a dozen. This is also a very labor-demanding job, especially if you are working singlehanded (which seems to be the story of my life). The safest number of through-hull fittings is zero, as Don Casey stated accurately, and I found 13. First I determined that the seacocks were operating well, but some of them were gate valves, which is unacceptable, of course. 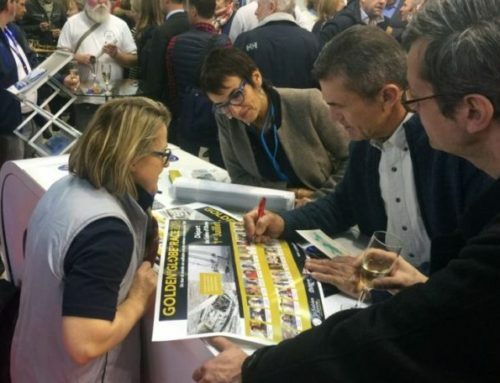 Then I wanted to determine the thickness of the hull, since I was preparing for a possible collision among the high latitudes during my ocean marathon in 2018. I started by removing a couple of skin fittings, then ended up removing all of them after discovering irregularities in hull thickness. 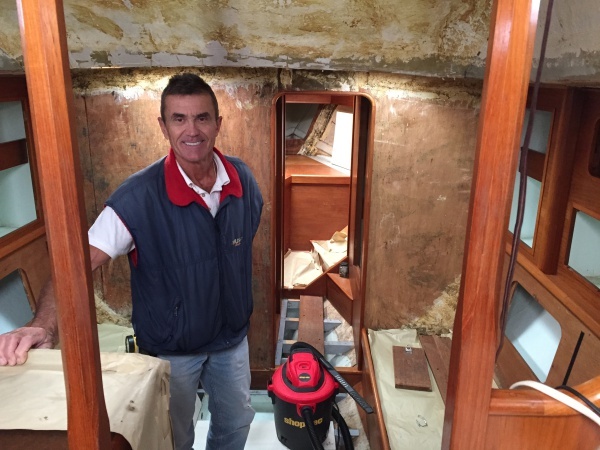 We laminated an extra 11 layers of fiberglass below the waterline when building my solo circumnavigator boat in Hungary in 1988 (See my book Kihivas, recently published in the US). Perhaps I went overboard then, but Salammbo never let me down during 60,000 nm of offshore sailing. 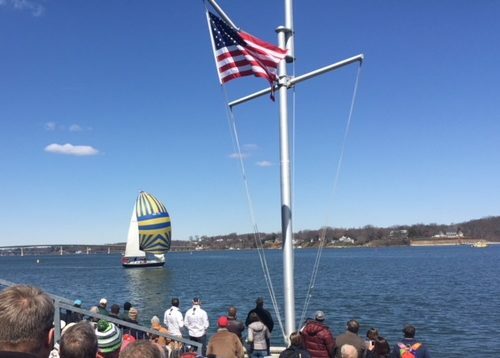 I would like to add 3 layers of fiberglass/Kevlar combination to this hull, but unfortunately Kevlar (or any recently developed material) cannot be used in this retro race. In addition, I do not have the funds for it anyway. 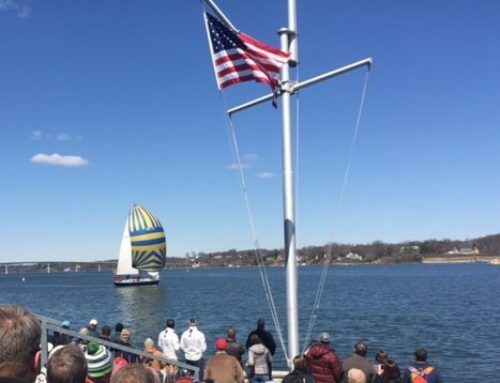 The dilemma is clear: should I spend more time on a frustrating sponsor hunt and delay the outfitting of the boat, or cut back on my desire for safety and gamble the race? Well, let’s move on for the time being, but remain on the topic of the flotation. There are 2 cockpit drains, as is usual in similar boats. But since the cockpit in the Tradewind is really deep and large, I will have to install 2 more drains in preparation for the Roaring Forties. 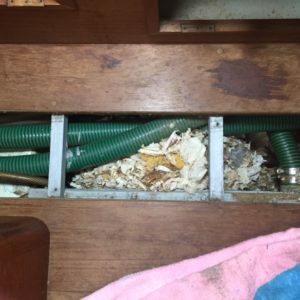 I will also certainly have to reorganize my plumbing, if I want to avoid drilling even more holes in the hull! 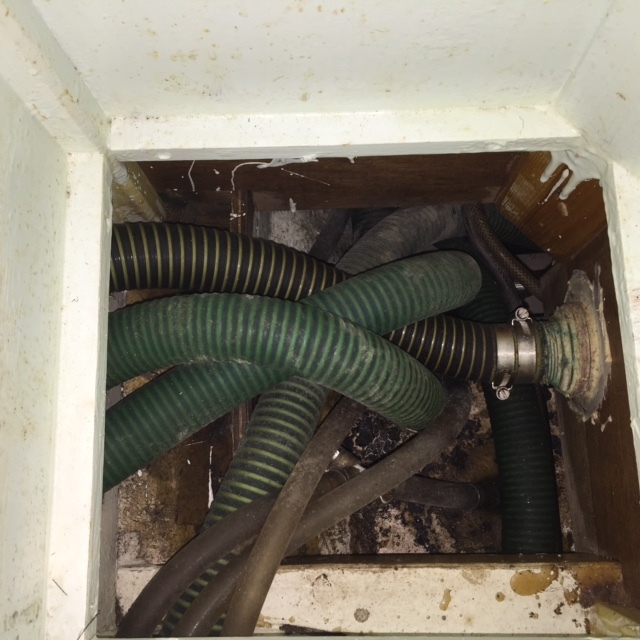 Luckily, I will not use the holding tank discharge that has been freed up by the elimination of that tank, so one of the prospective cockpit drains has been accounted for. And there is a freshwater tank overfill discharge under the transom—above the waterline but close to it—and this might work as a high level cockpit drain in case of complete flooding (while the overfill discharge can be redirected). 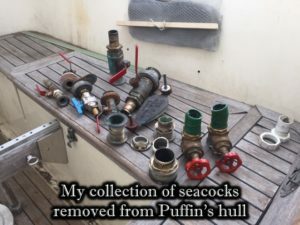 I have to add electric bilge pumps to my replacement list as well, since Puffin has only 2 manual bilge pumps, and no high-water alert at all. The requirement of a waterproof bulkhead behind the chain locker is common sense and mandatory for the Golden Globe, but Puffin has none. 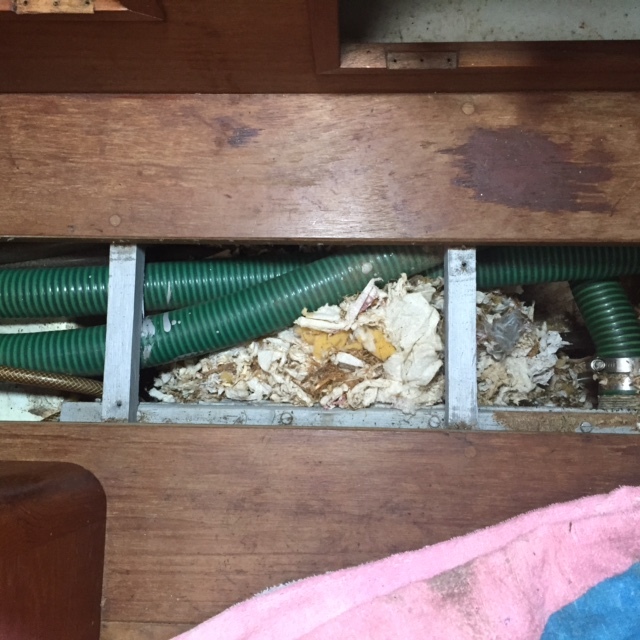 Moreover, the anchor chain is led through hawsepipe to its storage position under the floorboards. I asked my good friend, Gary Bass at Precision Marine products, FL, to fabricate a customized aluminum bulkhead with a secured opening that I can bolt through on the bow side of the existing plywood bulkhead, in order to use that space accordingly. I will solve the 2”-diameter hawsepipe opening with a properly installed seacock. The flotation is impacted by the condition of the deck and its openings, too, but the deck and the hatches are in good condition (except for the paint). However, I plan to replace the front escape Lewmar hatch (depending on my budget, of course), since it does not have opening handles on its topside to allow access from the deck. 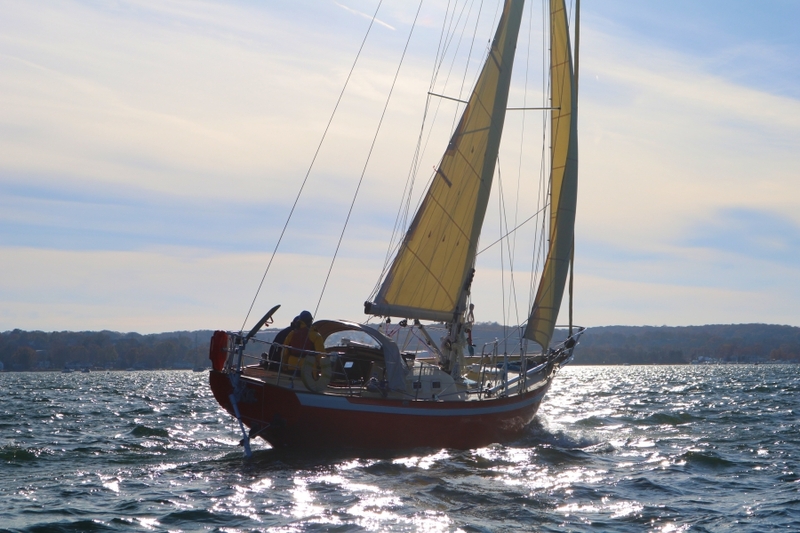 Also, the windlass should be re-bedded, and I will add a seacock to the chain fairlead to prevent leaking offshore. Thank you for taking the time to detail your restoration. It is a great addition of knowledge for those of us who wish to travel in your footsteps.